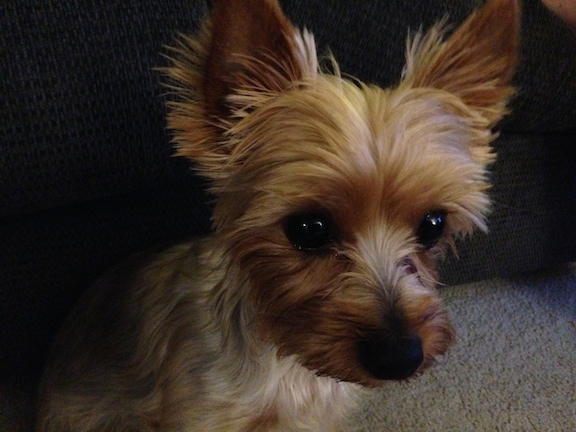 Peanut is a one-and-a-half year old Yorkie who barks quite a bit and only listens to her owners when she feels like it. I could tell that Peanut was an insecure dog the moment I met her. She was darting all over the room barking like crazy. She made it clear that she didn’t agree with my arrival and that I was there without her permission. I corrected her which temporarily stopped the barking, but only for a moment. Frankly I think she was confused that a human was disagreeing with her / challenging her authority in a way she understood. After a momentary lull, she jumped up on the couch and started barking again. For dogs, the height at which they sit or stand has a correlation to their perceived authority amongst the members of their family or pack. In Peanut’s case, being on the couch made her feel more powerful so I suggested that they not allow her up on the furniture for a week. This will help remind Peanut of the difference in authority between human and dog. I showed her owners how to get Peanut to get off the couch on her own volition. I always advise against picking a dog up off the couch or shoving them off it completely. Instead I like to nudge the dog to the edge of the couch so they feel as if they may fall off. This causes the dog to jump down on their own which helps define the difference in authority between the dog and the human. Once on the ground, I had her owner put Peanut on a leash and then took it so I could pull her close to me. I didn’t try to pet or make friends with her. My intention was to remove her ability to bark from a distance or bark and run away. I stepped on the leash about a foot from where the leash attached to Peanut’s collar. As soon as she was next to me her barking stopped. She attempted to pull herself away, but once she realized she couldn’t, she sat and then laid down. After a moment, I moved my feet off the leash, but did it slowly so she wouldn’t notice. As Peanut continued to lay on the floor a few feet away form us, her owner told me they had never seen her settle down so fast. I explained that a lack of rules, boundaries and structure caused Peanut to think it has the same authority as her owners. By making her get down from an authoritative position (the couch) and removing her ability to bark from a distance, I forced her to develop a new way to deal with the situation. Next I went over an advanced leadership exercise to help Peanut’s owners assume a more authoritative position in the dog’s eyes. I was able to get Peanut to complete the exercise fine, but when it became time for her owners to repeat the process, Peanut ignored them, showing a complete lack of respect for their authority. I was eventually able to get one of her owner’s through the exercise, but it took a considerable amount of time and effort due to his hesitation in his movement. Because dogs respond to clear confident leadership, her owner’s hesitation caused the dog to ignore his attempts to disagree with her. I decided to switch to an easier leadership exercise where the dog is asked to stay inside a kennel with the door open. Once the dog surrenders and lays down in the kennel, the owner rewards this behavior by giving the dog permission to come out. Unfortunately Peanut’s owners had forced the dog into the kennel in such a way that the dog had developed a negative perception of the kennel. This resulted in her refusal to come near the kennel. To help Peanut get over this fear of the kennel, I tossed a few high value treats in front of and right inside the kennel. After doing so I remained completely still and told her owners that we needed to stay completely silent as well as motionless. Peanut was curious and the scent of the meat treats was enough for her to work up the courage to slowly investigate and retrieve her treats. She would move in, take a few, then jump back before repeating. We were making good progress until it came to the treats in the middle of the kennel. To reach this treat, Peanut had to place a paw on the plastic tray at the bottom of the kennel which made a noise that startled her away. Any further attempts to get her to enter the kennel were fruitless. Whenever you are facing multiple behavior issues, I find it helpful to work on each issue individually. I slid the trey out of the kennel and tossed a few treats into the kennel. After some coaxing, I was able to get her to come over and eventually go completely inside the kennel. After she did this I repeated the exercise a few times to help her gain confidence and learn that nothing bad was going to happen. I advised her owners to repeat this exercise over the weekend and showed them how to get the dog over her fear of stepping on the tray. Once that is the case, I showed her owners how to conduct the easier leadership exercise with the kennel. While the fear of the kennel prevented her owners from practicing the leadership exercise, Peanut was much more respectful of their corrections and commands. She attempted to get on the couch a few times, but by the end of the session, they were able to tell her to get off the couch without having to physically move her. Something they said was not possible before the session. Aswe were wrapping things up, my client’s neighbors started to shoot off fireworks outside. Peanut started barking to disagree with them, but her owners used the methods of communication I showed them to disagree with her. As soon as they did, her barking stopped. As the fireworks went on, they had to correct her less and less until she stopped barking at the fireworks altogether. By adding rules and boundaries to their dog’s life, Peanut no longer thought she was equal to or superior to her owner’s authority. This behavior will become permanent if her owner’s continue to enforce the rules and structure so that Peanut learns to defer to their authority and follow their lead.